Every kid LOVES coming to the dentist, right? We’re here to make sure that happens! Kids are impressionable, and we want to start their dental visits off on the best note. We focus on education for kids and parents, and nutrition for helping teeth grow nice and strong–all while making it fun! Check out Dr. Cromwell’s girls learning how to brush with Mickey and Poppy! 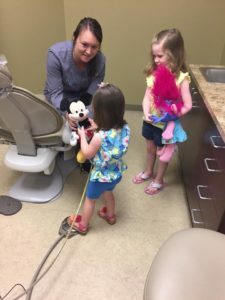 What will happen at my child’s first dental visit? One of the biggest causes of fear in the dental office is the unknown. Preparation is key when bringing a child to the dentist–educate them at home with this information and they will be ready from the time they walk in! With kids (and often nervous adults! ), we approach everything with the TELL, SHOW, DO method. We explain everything first, then show what we use and how, then do it! Kids come in to a welcoming reception area with plenty to do while an adult fills out some paperwork for us. We can find their favorite cartoons, read a new book, or color a beautiful picture to take home! Lisa or Lauren brings the child back and the fun begins! We have a chair they can ‘take a ride in’, a squirt gun to spray water in their mouth and a sucky straw to get it out, and a special toothbrush to make their teeth sparkle. Picking which yummy flavor of toothpaste is often a tricky decision! Our hygienists will discuss any areas we can improve our brushing, and tips and tricks for taking perfect care of your teeth at home. After their teeth are shining, Dr. Justin comes to check for sugar bugs! Sugar bugs cause little holes in the teeth, so Dr. Justin wants to make sure he doesn’t see any of those. This is also when Dr. Justin will talk about nutrition at home–the good, the bad, and the suprising cavity causers! Toughest part–picking a toy out of the treasure chest! You’re all set! If Dr. Justin found any concerns, we will go over all the fun stuff with the grown ups while the kids get to go play again. If you had a perfect check-up, we will do it all again in 6 months! First dental visits can be tough, but it’s easier when you know what is happening and what to expect! We will do whatever we can to make sure kids are comfortable and enjoy their time here.